Is There An Artist In The House? I am not one for any kind of dogma, so I do not think that Artists should have to make art in any particular way at all. For my own practice I see it like this: The ship is going down and what am I going to do about it? I do not want to make art for art’s sake alone, nor do I want to make art for artists alone. I want to make my tiny offering of art for the planet, and multitude of ecosystems and communities that live on this great whirling rock in space. Two books on art have changed my thinking more then any others, the first one was “The unpainted Landscape” essays and texts, by Simon Cutts. The other was “Conversations Before the End of Time” by Suzi Gablik. These books shifted my practice that had been more about the modernist ideal of art for arts sake, towards a more socially engaged way of working. In the words of Suzi Gablik, “…for such artists, vision is not defined by the disembodied eye, as we have been trained to believe. Vision is a social practice that is rooted in the whole of the being.” from The Nature of Beauty in Contemporary Art, New Renaissance Magazine. 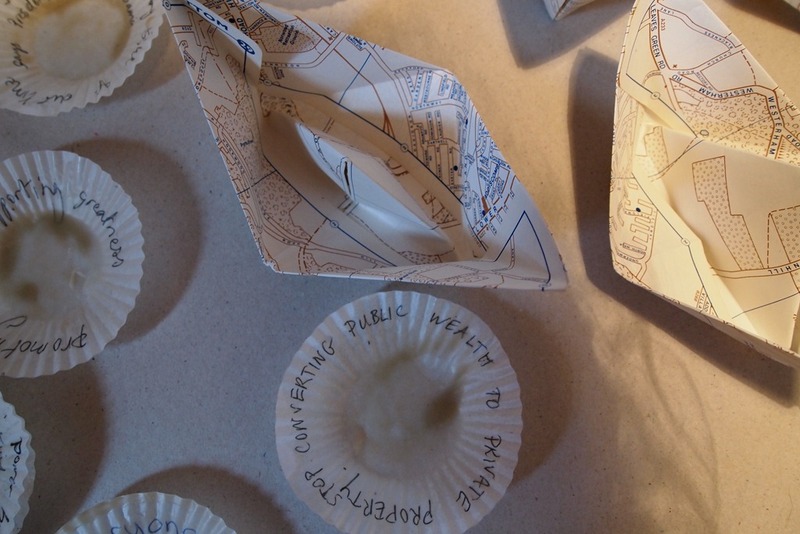 Currently, I am making an art work with muffin cases and another with maps folded into paper boats. On the paper cases I am writing different things that would change the world for the better, in my opinion. I would also like to write other people’s wishes for a better world. If you would like to send them into the comments, I would write them down and dip them in wax as part of an artwork. Happy dreaming of a better world! I love your perspective. What a wonderful way to view art. Thank you! I think your view and perspective on art is wonderful too! I consider myself and artist although I work in clay and textile. I have become impatient with those that think an artist is someone who only works in oils, watercolors, bronze or marble. I honestly believe “art” cannot be put in a tidy little box with a ribbon around it. I think the creative process IS the art regardless of the medium. I totally agree with you. All or at least most of my favorite artists use materials that are not valuable in themselves or typical “art materials” but are transformed by the creative process. Such as Lygia Pape, Rivane Neuenschwander and Michelangelo Pistoletto. Minimal materials, maximum inventiveness. I love working with clay and textiles. Oh I am so sorry that it took so long to reply to your comment I have not been using my computer lately just my phone. I hope to start blogging again very soon though. Happy Easter Holidays to All!